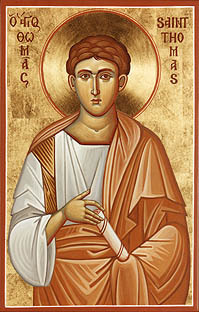 St. Thomas, called Didymus, is remembered as the apostle who refused to believe in the Resurrection unless he actually touched the wounds of the risen Christ (John 20:25-28). There is much uncertainty about his missionary work after Pentecost. The generally accepted tradition placed it in India, where the Syrian Christians of Malabar claim that they were evangelised by St. Thomas. He was martyred, by spearing, on the 'Big Hill', about 14 km from Madras; and was buried at Mylapore, now a suburb of Madras, in 72 AD. An ancient cross of stone marks the place where his body rested before its translation to Edessa in 394. His relics were later taken to the island Chios in the Aegean Sea and from there to Ortona in the Abruzzi.